As I grew older, I became forgetful. Until now, I copied several songs , however, I can not play most of songs which I have played before. Even a song I played a week ago, I completely forgot. I wanted to keep a accurate score how to play a song by guitar. As I don't read/write music score , I tried to write guitar tab. What I saw when I wrote guitar tab was it was difficult to write rhythm pattern , whether the note is quarter note , eight note or dotted ????? So I wrote only positions of guitar frets and which strings. 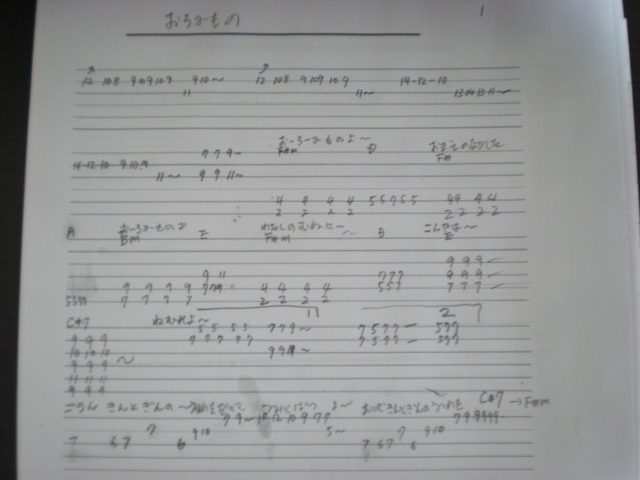 Following is the my guitar play according with my guitar tab which I copied.